Please note: This review was written a week after my first visit to Uncle Jack’s Good 2 Go in Ocean. They specialize in falafel (and pretty much only that). As is the case with most of my reviews, I held this from publication just to space things out on my blog. A couple weeks later, I ate at this establishment again, and became sick with food poising within an hour of leaving. Now, I believe in giving credit where credit is due, and so I will not alter my extremely positive review below. But let this serve as a warning. I will NEVER eat at Uncle Jack’s again. That was the sickest I felt in years. It lasted for days. Eat at your own risk. Its a shame, because I did enjoy the two meals I ate there and also a surprise due to how clean the place seemed and how fresh the food was. The name Uncle Jack’s doesn’t exactly conjure up images of the legendary deep-fried middle eastern goodness known as falafel. In fact, even today, in areas near the Mediterranean, debate rages on trying to figure out who exactly invented the crispy balls of blended chick peas and spices. Everyone has their own recipe, and each method of cooking and preparation is authentic, so say those arguing. Either way, what is served up at Uncle Jack’s is as good as I have ever had elsewhere, and rivals what might be cooked up in a food truck in New York City, or perhaps even across the pond. This restaurant is quite small, and the menu is even smaller, but make no mistake: if you are coming here for anything other than falafel, you might as well just turn around and eat somewhere else. You can get it stuffed in pita bread as a sandwich, or on top of a salad. Both versions are delicious. Each serving comes with four decent sized chick pea balls, and you get a choice of unlimited salad-like toppings to go in your pita or on your platter. I went with the pita sandwich, and added lettuce, tomato, onions, tahini sauce, hummus, and pickles. At first, I was concerned that the sandwich might fall apart, because once a pita is stretched with other items, it easily breaks. That did not happen here. The pita with thick and sturdy enough to accommodate everything I wanted. 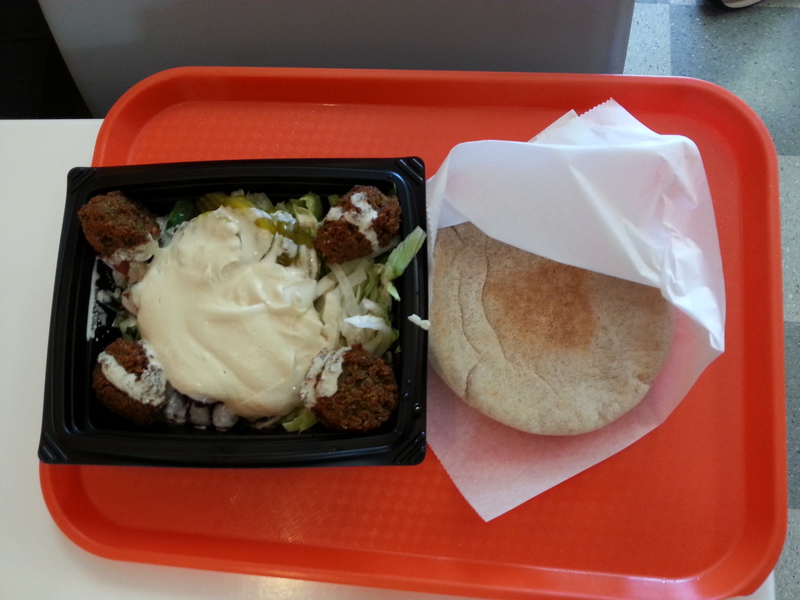 The falafel balls themselves were perfectly fried and crispy, and more importantly, not overly salty. 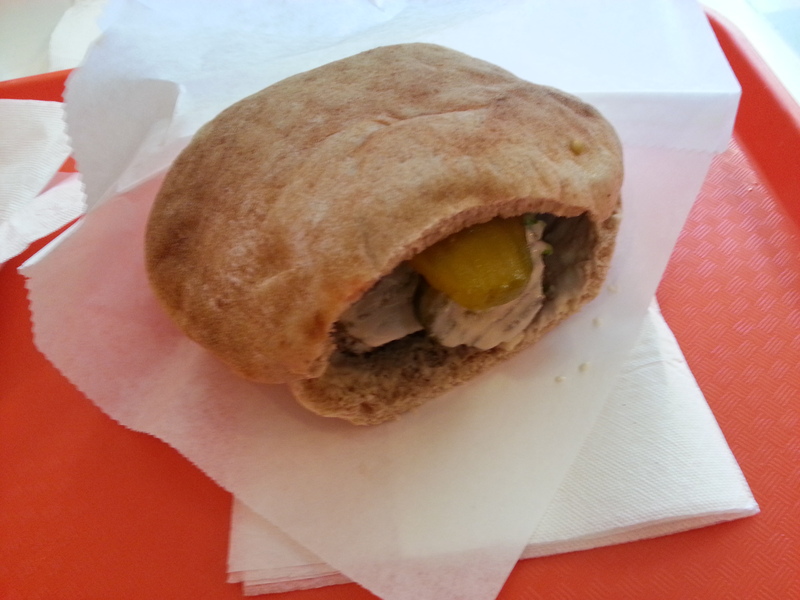 The tahini was amazing and the hummus was some of the creamiest you could ever find. However, what made this sandwich was…the pickles! The acidity of them interacted nicely with deep-fried falafel, and added additional sweetness, flavor, and crunch. Do yourself a favor if you come here: add their pickles to whatever you are ordering. 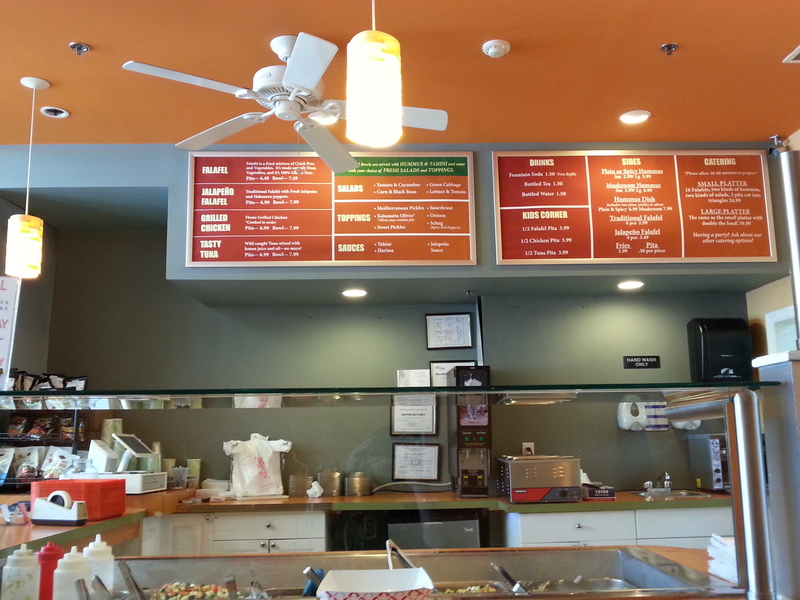 It is also worth noting how immaculately clean the interior of the restaurant is, and how fresh the food appears to be. Everything is homemade. I’d be willing to bet they don’t have a freezer in the place. They only have a few servings of falafel waiting under the warming light at a time, with a cook in the back on standby to make more. A side of fries was cooked for us upon order. All vegetable additions were displayed along the counter, and were full of color and freshness. The service is also very friendly and helpful. 3 out of 5 stars. This review was previously posted here. Uncle Jack’s Good 2 Go is located at 1580 Route 35 in Ocean, New Jersey.